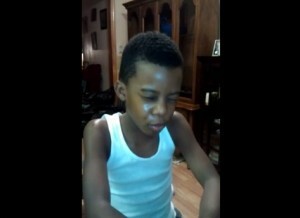 A viral YouTube video capturing a young boy praying for–or to–Barack Obama has ignited outrage in cyberspace, generating hundreds of negative comments from viewers. The video, Prayer for President Barack Obama, was posted on Sunday, and soon skyrocketed in hits shortly after being uploaded. An African American boy named Steven introduces the recording as being his prayer for Obama. The boy’s prayer then ends with an exaltation. Response to the video has been largely negative. Some stated that they felt sorry for the child and criticized his parents. Other comments were harsh and laced with profanity. While many were shocked by the video, controversy over perceived Obama worship has been erupting since the 2008 election. As previously reported, writer Dave Jolly notes that during the election, Maggie Mertens, associate editor for the Smith College newspaper, penned an article entitled I Will Follow Him: Obama as My Personal Jesus. Additionally, to mark Obama’s 100th day of presidency, artist Michael D’Antuono unveiled a painting that depicted Obama in the oval office wearing a crown of thorns and raising his arms as if on the cross. During the Democratic National Convention last September, a number of vendors offered products that depicted Obama as a type of messiah. 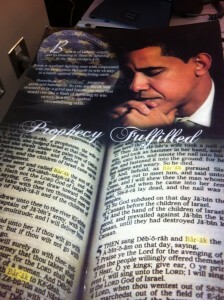 One poster that was sold at the DNC displayed the head of Obama, which faded into a graphic of an open Bible with the word “Barak” highlighted. Above Obama was the headline “Prophesy Fulfilled.” T-shirts were also sold by vendors that cite Psalm 110:1, which says, “The Lord said unto my Lord, ‘Sit Thou at My right hand until I make Thine enemies Thy footstool.’” Additionally, Obama calendars were up for sale, which used Scripture for each month of the year to point to Obama. Prior to the 2012 election season, Florida A&M professor Barbara A. Thompson also penned a book entitled The Gospel According to Apostle Barack in which she claimed that she was given a series of dreams by God where she was able to realize Obama’s purpose as the leader of the free world.